My last Library post was all about Double Duty rooms and how to create a library space within another room. Those were primarily in Family/Living Rooms, Dining Rooms and Bedrooms. In my look at Home Libraries, I’ve come across even more creative and adventurous types; avid readers who’ve carved a home library out of rather unusual spaces. Enjoy! 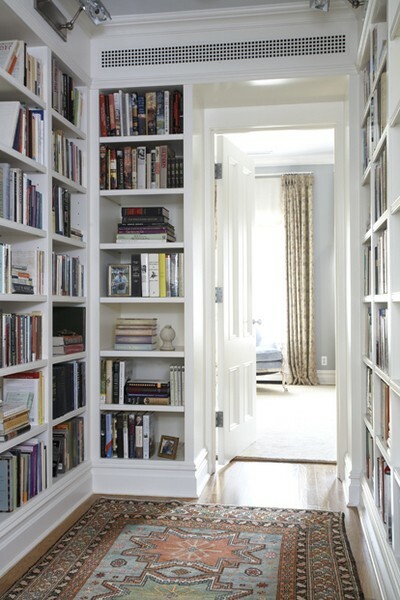 Hallways are a great space to locate your library, particularly if you’ve got a wide area, or landing area. 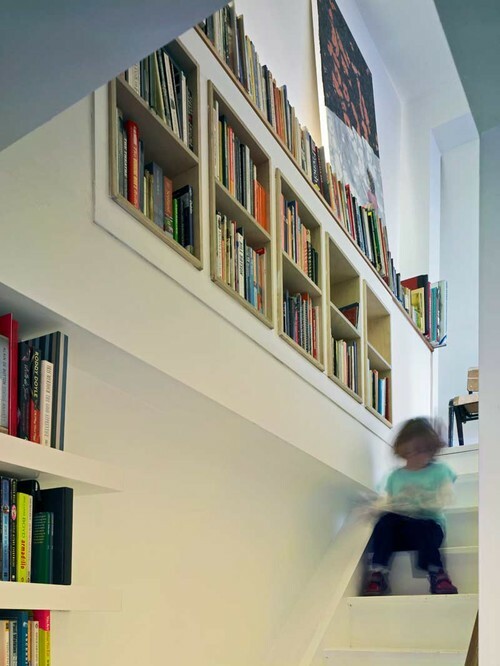 The walls of a hallway are an otherwise unused space, which make it a great spot to store your books. But don’t force it. If your hallway is too narrow, the library addition will feel cramped. Worse, you may damage the shelves, books or other objects trying to squeeze new furniture or other large items down your hallway library. 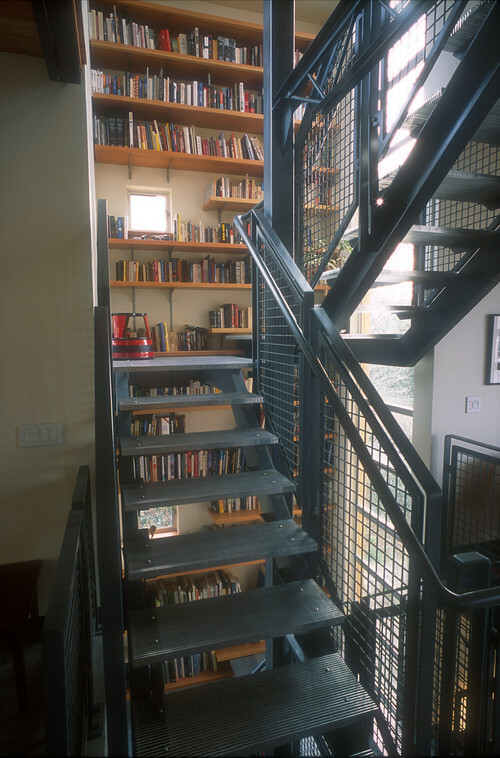 Stairways and landings make a great library. It’s a functional and interesting use of an otherwise empty pass-through space. And it’s made even better if you have the luxury of a window and a window seat. I love the two libraries below. It is a creative use of stairwells. Industrial Staircase by West Vancouver Architects & Designers PLACE architect ltd.
Perhaps the most unusual library space that I’ve come across is in the bathroom. What is even more surprising is that I found several of these bathroom libraries! If you don’t have a bathroom that lends intself to building bookcases into the wall, this bathtub may solve that for you. It’s a bathtub with it’s own bookcase builit into the side. Clever. Do you have an unusual home library? Have you been inspired to create one?